Maybe it’s how we’re wired as humans, but designs found in nature seem to be the most loved of all. Take marble for instance. 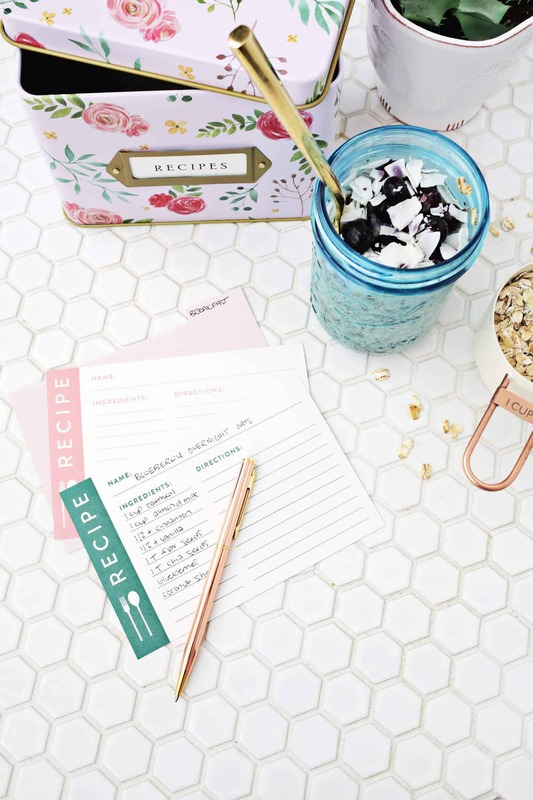 It’s the darling material of high style kitchen renovations, and in a much less expensive media, adorns the surfaces of stationery, manicures, and wall art. I’ve personally been drawn to marbleized wall art recently, as you may have noticed in my Scout & Catalogue for Debbie Carlos poster seen in my living room here. Several of you were curious how to marble your own paper, and I was too! So I set out to learn a new craft, and failed a few times before I succeeded. Check out the different processes I tried below and see which ones I liked the best. Skip down to Attempt #4 if you want to cut to the chase and aren’t interested in the problems I encountered along the way. Marbling is achieved by floating pigment on water and laying paper over the water to transfer the pigment design onto the paper. It may seem straightforward until you consider buoyancy and other variables in the mix. My experience was certainly a comedy of trials and errors, but after a bit of experimenting, I hit my marbling sweet spot. How do I keep the pigment from sinking into the water? I used methyl cellulose to thicken my water (see instructions later in this post), but still had issues with my pigments sinking. See what happened with each process later in this post, but I’ll tell you right now—oil paints are the best for floating on water, but I also recommend that you properly thicken the water. How do I make sure the design I make in the pigment doesn’t float away as I lay down the paper? As I laid my paper across the surface of the water to transfer the design onto my paper, the water below shifted, and the pigments along with it. The best method is to make sure your paper is pliable (not stiff) and wrinkle-free so you can lay down the paper without disturbing the surface of the water. This will ensure the crispest transfer of your design. What kind of pigment will attach to the paper the best? I found that oil paint created the boldest designs, but most importantly, your paper should be properly prepared first. After transferring the design onto the paper, you’ll actually need to rinse off the paper. Normally, this would probably cause the ink or paint to be washed off the paper as well, but if you prepare your paper with alum first, the design will adhere to your paper while the excess paint and water will be rinsed away. Read further in this post for best methods of preparing the paper. Preparing for marbling is very simple, though it does require a one hour wait time. You will need to thicken your water and prepare your paper, both processes requiring rest time afterwards. Preparing the Water and Tray: If you are working with small scale paper, you can use a baking sheet with walls (such as a jelly roll pan) and just an inch of water. A jelly roll pan will only require about 1 quart of water to fill it, though you will probably want to prepare more water in case you have issues removing unwanted paint from the water between marbling sheets. I stored my excess thickened water in mason jars for later use. If you are using larger scale papers, you will need a large, shallow basin, such as an under-bed storage drawer, which is what I used. This storage drawer required about 3-4 quarts of water. Thicken the Water: To thicken the water, you will need methyl cellulose, which is a powdery substance that mixes with water to create a consistency much like a thin gelatin. I prepared my water in a stock pot which has measurements marked out along the inside. 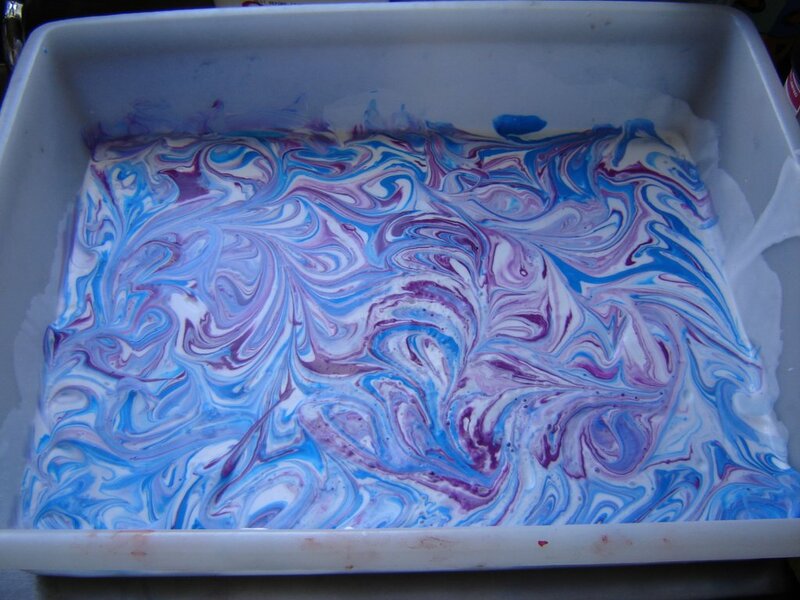 Mix 1/4 cup of methyl cellulose with 2 quarts of water for the best marbling consistency. Use a whisk to stir the mixture and let it thicken for one hour. To ensure an even consistency, it’s best to whisk the mixture thoroughly every ten minutes, or you’ll end up with globs at the bottom of your pan at the end of an hour. After an hour, you may pour the thickened water into your marbling pan and begin! Preparing the Paper: You will need to cover your paper with alum in order for the design to transfer from the water to the paper without getting washed away. You may apply the alum with a brush, sponge, or a spray bottle. Mix 1 tablespoon of the powdery alum per one cup of water, and then thoroughly wet the surface of your paper. Lay the paper flat or hang it to dry. After the paper is dry (about one hour), you’ll want to iron it—yes, using an actual hot iron to make sure it is as flat as possible for the marbling process. You may have success with ironing a slightly damp piece of paper to prevent set-in wrinkles. You may look at the above pictures and think, “Ooooh, this one looks pretty!” Well, that’s what I thought too. But when I tried to transfer the pretty design onto the paper, it didn’t go so well. Method: I began with about two inches of thickened water and gently dropped ink directly from the bottle’s dropper into the water. I added a turquoise blue and an olive green ink, then swirled them around with the handle of a spoon to make my design. I gently laid paper prepared with alum onto the surface of the water, then carefully peeled the paper away from the water. Because the alum ensures the pigments’ adhesion to the paper, I then rinsed the thickened water residue from my paper and was disappointed to see only a faint marble design, as seen below. Result: The ink was not staying afloat at the very top of the water, even though my water was thickened. You could still see the design in the water, though it was just below the surface. In addition, the pigment of the ink just didn’t seem bold enough to adhere properly to the paper for a crisp design. Maybe it was the colors I used, but I decided to give up on ink and try a different method. This resulted in such a similar fail as marbling with ink, that I didn’t even bother taking pictures of the results. My method was the same, only instead of using ink, I used heavy pigmented gouache water colors which I diluted to the consistency of cream. The pigments were still too soft and still wouldn’t stay on the surface of the thickened water. My main issue thus far seemed to be keeping the pigments floating on the water. To solve this, I switched to oil paints, since oil does not mix with water. Ideally, the oil paints would float above the water, so I wouldn’t even need to thicken it. Or at least, that was my initial idea. Method: I filled a jelly roll pan with water and dropped diluted oil paints onto the surface with a dropper. I could tell as soon as I began swirling that I didn’t have much control over the design. I then carefully laid down paper which had been prepared with alum, but the paint was swiftly moving across the surface of the water no matter how delicately I laid down the paper. I tried one without preparing the paper with alum too (the framed one above), which didn’t turn out half bad. I did not rinse that one, but I did rinse the pieces which had been prepared with alum. Result: The oil paint did float without the assistance of a water thickener, and did produce a much bolder design, but the design was very difficult to control as it floated on water which had not been thickened. This observation led me to my final, successful attempt at marbling paper. Ding ding ding! We have a winner! Now I knew that oil paints were the best for floating on water, I just needed to control them a bit more. So I went back to using thickened water. This was my marbling sweet spot. Method: I filled my large basin with about two inches of thickened water (see preparation instructions above) and used a decommissioned children’s Tylenol syringe to apply my diluted oil paints. I had diluted the thick oil paints with white spirit to get them to the consistency of heavy cream. After dropping the colors into the water, I used a coffee stirrer to swirl them around in a pretty pattern. This is where you can get creative and play around. Then I carefully laid colored paper prepared with alum onto the surface (see preparation instructions above), gently pressing along the back of the paper to make sure no parts of the paper were still raised off the water. I let the paper rest for several seconds, then gently peeled it off and rinsed off the paper in the sink to get off the excess paint and goopy water. I hung the paper to dry, then ironed it flat when it was just slightly damp. Result: This method of floating oil paint atop thickened water created the most controlled and bold designs of any method I tried. It is tricky getting the excess paint out of the water in between sheets of paper (lots of sheets of newspaper to draw out the paint), but I loved the way each subsequent print turned out with this method. Choose the right paper. The paper you use should be absorbent, but only moderately thick in weight. If it’s too thick, like high quality water paper, it will have stiff wrinkles after preparing the paper with alum. Even ironing out the dried paper before marbling will not remove all of the wrinkles and they will keep you from getting a smooth transfer of the floating pigments onto the paper. Colored paper is also a good choice because it already has a nice background hue before adding your marbled design. I was not happy with the performance of watercolor paper in my experiments, but I found that subtly textured art paper, particularly Canson’s Mi-Teintes paper, was my favorite. You should be able to find large sheets of this at art supply stores. Prepare plenty of paper before beginning the marbling process. You’ll probably mess up a few sheets of paper before you figure out the best paint consistency, paper laying/lifting method, marbling design for your desired outcome. I started out with plain white watercolor paper, but when I didn’t enjoy the results, I had to pause my project for a few hours while I bought more papers, prepared the papers, and waited for the prepared papers to dry before I could iron them and continue my project. Oh my goodness. These are amazing! This could easily add color to any room. The end result is so beautiful Mandi! I love the different colours that you used. I feel like marbled wall art is such a fun twist on a classic design. Thank you so much for this post! I really appreciate that you showed your whole process – the good and the bad. I know that sometimes with DIYs I get tempted to skip steps if they seem expensive, so it’s good to know that there’s no skimping with this one! I haven’t done this since I was a kid! I used to love it. It has such a pretty effect. they look amazing….a great experiment to do with the kiddos on a cold or rainy day. This is gorgeous! I love the light and blue one most. What a beautiful project Mandi! It has the look of a galaxy. I think it can also be a great project for kids on a smaller scale. These are tremendously beautiful! Doesn’t look like the easiest of afternoon projects, but the results make it worth a try…! I’ve done it with kids using thickened water and diluted acrylic paint, and card stock, not treated. Lots of fun, great results for the most part, some of the colors have a tendency to separate. I just use those inexpensive little bottles at the craft store. So lovely! Thanks for doing the legwork to figure this stuff out. Gotta admit I like to skip the science and get right to the art! I’m on a wallpaper crazy lately, so now you have me thinking what could make it possible to turn these beauties into wallpaper?? (Besides modpodging directly to the wall, which I feel like would be a bad decision for resale). Anyway, thanks for the inspiration! We did this in art school! It was my favorite assignment. SO MUCH FUN! marbeling is such an intuitive work – free-spirit way, you are right! I failed a lot before I was satisfied with the results. thank you for showing your processes. Thank you so much for all of your helpful tips and information! I can’t wait to try this and feel so equipped to do so! I always used shaving cream. Hahahah. It made me happy to see it is not traditional painting – so those who doesn’t master painting can keep up. Oh, I really like it! I was just about to type about the hound in sunglasses! Raybans I’d say haha! That’s gorgeous!! I really want to try it, it would make such an interesting art piece for my living room!! Hi. Great tutorial! I love the framed pieces. I have had great results with acrylics, but I do dilute them to the consistency of skim milk, and I often add a couple drops of ox gall to aid in color flow. So, if someone out there is interested in trying this with non-oil paints, it can definitely be done. These are beautiful! It’s interested to read about what did and didn’t work. The orange one in the last photo is stunning! Love the idea! I did it at school but don’t really remember how. The result is Awesome! These are just so beautiful!! This is amazingly beautiful. Home run girl! I admire your dedication and patience through this process! I guess the forth time was the charm, right? This is the perfect project for me because I’m working on redecorating my room. Marbled art is gorgeous and I love how no two pieces will look identical. * The kids version is pretty fun as well…it’s called bubble marbleing You put liquid dish soap in some water (enough to make bubbles) and some liquid ink. Use a straw to make it bubbly then drop on your paper (untreated). It really does look pretty cool. * Thanks so much for your precise instructions as well as your failures. You’re a good teacher! I had a marbling kit when I was a kid, I remember messing around with the colours and paper for hours! It was a HUGE hit at my Birthday party that year too. Keen to try the oil pant after seeing this post, beautiful! The end results are so beautiful. Honestly need to give this one a go asap. This is such a cute D.I.Y! This is probably a stupid question, but did you try marbling paint? I did this a few years ago and we just used something called marbling paint, that you dripped onto the water. No water thickening needed, and the results turned out really good! This is so pretty! Such a great idea for making your own artwork for your home. Is it easy to buy methyl cellulose?? Mandi, this is so helpful! I tried to marbleize paper cards last year and it was a huge mess and I wasn’t thrilled about how it turned out. I will definitely be re-visiting this post when I try it again. Your marbleized paper looks beautiful! I’m so inspired!! Can you recommend a place to get the paper? White and colored paper? Thank you! This is awesome, thank you! I just wanted to add, I thought it looked like there was a dog in the first/last photo shared, right in the top right corner with his mouth open, wearing sunglasses haha! I also have that same print from Debbie Carlos! Where did you get your lovely frame for it, because I’m struggling to find a frame big enough. Also, I’ve always wanted to know how to marble! Such a great tutorial. Loved seeing the process and all the trial/errors! Thanks for sharing! Lovely! I’ve been experimenting with marbling this week… we used cheap shaving foam (instead of thickened water) and liquid watercolours. My kids loved it and got some great results. I was wondering if we could use the oil paints with the shaving cream method. Have you tried that? I liked the regular acrylic paints with the shaving cream, but thought the oil paints would be brighter and more marblized. Just wondered if you had tried that. These are beautiful!! I have only every done the kid-friend version where you put shaving cream on a cookie sheet (or paper plate) and then drip food coloring on to it, swirl, and press your paper on top. Wipe the shaving cream and like magic, you’re left with amazing swirly paper. We made bookmarks for teachers this way! The kids loved it. Another really easy way to do paper marbling is using shaving cream and food coloring. You cover a baking sheet in shaving cream then add drops of food coloring and use a toothpick or a knife to create a marbled look. Take a piece of white paper and lay it on the shaving cream. Press lightly and lift gently. Allow time to completely dry and it’s all done. Marbled beautifully! So beautiful & thanks for sharing. A video tutorial would be super helpful. I’m a textile design student, and one of the classes we take is experimenting with different ways to create designs. One of the designs we made was marbling using shaving cream. you can control the colors and how erratic you want the swirls and its amazing to then paint on top of or to use for mounting photos and such. I’ve been experimenting with marbling myself. I just love the give and take experience of it. Try using metallic paints for an eye popping effect. And spray paint makes a wonderful textural difference. You’ll have to do a few experiments before you learn how to work with this because it can’t be controlled but when we learn to work with a medium like this ….its magic! What did you use as thinner for Oil paints? I tried Linseed oil but the color doesn’t spread over the size. Anyone else see a dog with sunglasses? Can any of the art be purchased. Here is the tutorial I was talking about it anyone wants to try it I bet that watercolor would work as well as ink if you don’t have colored ink https://www.bing.com/videos/search?q=marbling+paper+with+ink+and+soap+&view=detail&mid=D2AE7B37B112042133D6D2AE7B37B112042133D6&FORM=VIRE I haven’t tried it yet but it looks fun!